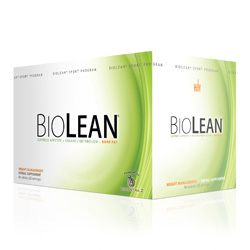 BioLean is a dietary supplement for weight loss, appetite suppression and increased energy. BioLean has a proprietary synergistic blend of natural herbal extracts and pharmaceutical grade amino acids that promote a multi-faceted approach to fat loss. Key ingredients such as Advantra Z®, guarana seed extract, green tea leaf extract and L-carnitine work together to increase the metabolic rate and encourage fat loss by elevating rates of thermogenesis and lipolysis. Our weight loss products work in conjunction with a sensible diet and moderate exercise. This product is gluten free. BioLean is white listed by the Netherlands Security System Food Supplements Top Sport (NZVT). OTHER INGREDIENTS (Herbal Blend): Calcium carbonate, starch, stearic acid, cellulose, hydroxypropyl cellulose, croscarmellose sodium, magnesium stearate, silicon dioxide. (Amino Acid): Calcium phosphate dibasic, stearic acid, silicon dioxide, croscarmellose sodium, hydroxypropyl cellulose, magnesium stearate, ethylcellulose. This formula is free of dairy, yeast, wheat and artificial flavors. RECOMMENDED USE: Adults take one packet (3 green tablets and 1 white tablet) in the mid morning with low calorie food. If using BioLean dietary supplement for the first time, limit daily intake to one white tablet and one green tablet on days one and two, and one white tablet and two green tablets on day three. Needs vary with each individual. CAUTION: Not for use by children under the age of 18. If you are pregnant or nursing, if you have heart disease, thyroid disease, diabetes, high blood pressure, depression or other psychiatric condition, glaucoma, difficulty urinating, prostate enlargement, or seizure disorder, if you are using a monoamine oxidase inhibitor (MAOI), consult a health professional before using this product. Exceeding recommended serving may cause serious adverse effects. Discontinue use and consult your health professional if dizziness, sleeplessness, severe headache, heart palpitations or other similar symptoms occur. The recommended dose of this product contains about as much caffeine as a cup of coffee. Limit the use of caffeine-containing medications, food, or beverages while taking this product because too much caffeine may cause nervousness, irritability, sleeplessness, and occasionally, rapid heart beat. Phenylketonurics: Contains phenylalanine 196 mg per serving.